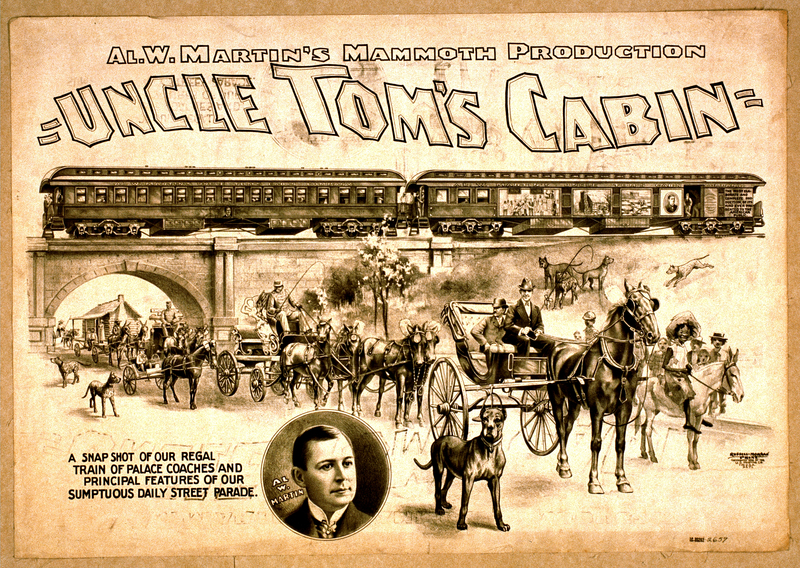 When the posters for this Tom show came out of their lithograph press in 1898 they were stacked face to face. The damage to this surviving example has been permanent. It is still marked with the ghost of another face, in reverse. So far, however, damage has made this piece of printed matter more readable, not less. The ghostly countertext makes us work more productively at seeing the survivor, and as the paper has turned brown it has contributed shading after shading of new complexity to the survivor’s spectral record. The parade is more intelligent now. In 1898, on the street, it was some horses, some mules, some dogs, and a model house made portable on a wagon. In the mind, it was a communication from a text off-poster — a text whose full title was Uncle Tom’s Cabin; or, Life Among the Lowly. There, off-poster, the on-poster word “sumptuous” seemed not to refer to anything. But in 2017, with all sense of what “sumptuous” might have meant in 1898 obliterated by what’s called progress, the palace cars can be seen as such, only as elements within a picture. And there, now, solely within the picture, at last! the palace cars have become one with the classical architecture of their mounting: in an ideal approximation of color, their shading completed by the passage of time, no longer on a mere overpass but on a plinth, no longer cramped smelly boring as they would have been in 1898 but, as the poster’s words promise, regal. In 1898 the pageant was a crudely literal play within a play and Al. W. Martin’s employees with their mule-propelled cabin were only rude mechanicals like Bottom and the boys in A Midsummer Night’s Dream. In 2017, surviving through time as a provisionally immortal snapshot, the pageant is seen at last as snapshot sees: mules and dogs and little black actress, stilled in transit toward us, passing just now and forever beneath a palace in the air. Having become a fossil, the mammoth production invites us to enter its matrix and see it within lithograph stone. Source: Library of Congress, http://www.loc.gov/pictures/item/2014636392/. Photoshopped.